Grilling steaks are much more than just a way of preparing your next meal. For some, cooking steaks on the grill are all about the quest for perfection. When it comes to grilling a steak, one thing that can't be stressed too much is the importance of getting the grill as hot as possible. Not using enough heat is a common error when you cook steaks. Sometimes this is because there's not enough heat available to begin with. Many home stovetops don't create as much heat as commercial equipment. But in many cases, home cooks tend to get a little jittery when they see a lot of smoke or hear a big, loud sizzle, and they turn the heat down. This is a natural reaction, but it can work against you. If you are prepared for the heat, you'll know how to cook with it. The grill is the best place to cook a steak. Apart from a fancy range-top grill, grilling should take place outside. This is convenient because, with the level of temperature you want, you're going to generate a good amount of smoke. No matter what kind of vent hood you have, you probably don't want that much smoke in your house. So, when it comes to grilling outside, should you use a gas grill, charcoal, or wood? The choice is up to you (you will always find people who favor one type over the other), but whatever type of grill you use, just make sure it gets really hot. It should be so hot that you shouldn't be able to hold your hand about an inch above the grill for more than two seconds. Obviously, you don't want to burn your food or start a fire, but when you're grilling a steak, it's really important to use the highest heat you can generate. This is because high heat cooks faster and the less time your steak spends cooking, the more tender it will be. Another reason for high heat is that it's the only way to produce the Maillard reaction, which is a chemical process responsible for forming the flavorful brown crust on the exterior of a steak. If your pan or grill isn't hot enough (or if you try to cook an ice-cold steak), you won't be able to achieve that brown tasty goodness. Instead, you'll get a tough gray steak without a lot of flavor. Grill Pans: Friend or Foe? Many agree that grilling is the best way to cook a steak, but not everyone owns or has access to an outdoor grill. Luckily, there are a few alternatives. You can certainly broil a steak in the oven or you can cook it on the stovetop using a cast iron skillet or grill pan. 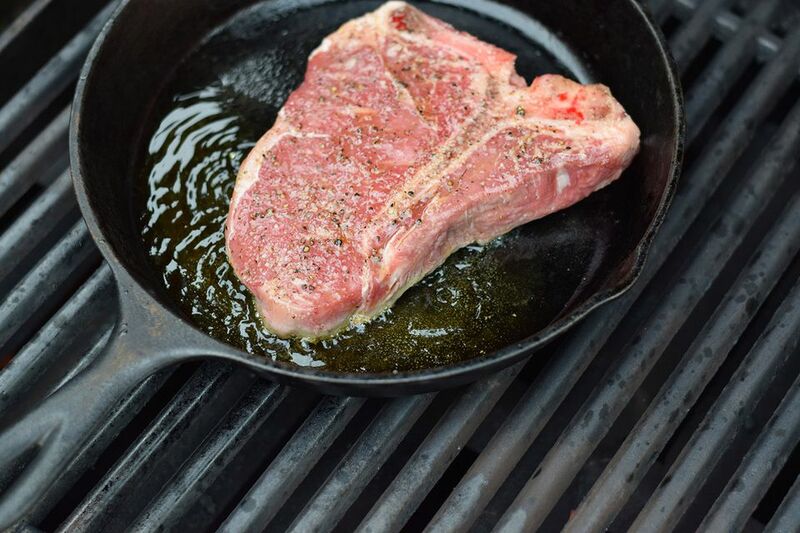 A grill pan is a perfectly legitimate way to cook a steak as long as you are able to get it hot enough. The best grill pan is one that's made of cast iron. Although cast iron is heavy and a pain to take care of (particularly grill pans, because the ridges make them harder to clean), cast iron gets hot, and more importantly, it stays hot. When cooking with cast iron, make sure you open your windows and turn the fan to high on your vent-hood. You'll also want to pour off any fat that collects in the pan while you're cooking. Whether you are using a grill pan or flat skillet, do not overcrowd the pan. An average skillet will accommodate two good-sized steaks. If you try to squeeze a third steak in there, you'll cool off the pan too much.